Funny how a recipe morphs and gets tweaked as it passes from one cook to the next. Recently, Laura Lafata, the chef who blogs on La Diva Cucina, unearthed a recipe for black sapote bars on another local food blog, Tinkering With Dinner. Bill Jacobs had been a Bee Heaven Farm CSA member and would document his culinary adventures every week. In fact, over the years, he came up with two versions of black sapote bars. 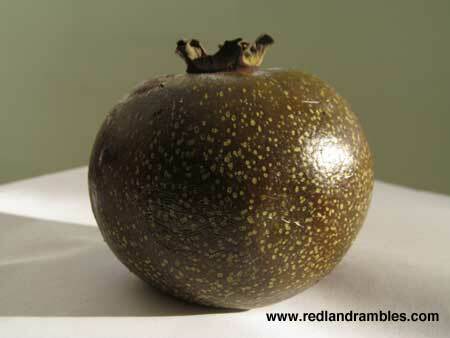 Just in time for black sapote season, La Diva tinkered with version two, and posted the tweaks on her blog. I suggested to Margie that I make the bars to sell at farmer’s market. Margie said her tree was loaded with fruit, and sent me off with enough to make a batch. La Diva had commented that the bars were tasty but very, very crumbly. I used her version for the fruit filling. But to improve the crust, I followed the recipe for strawberry oatmeal bars which I found on the Pioneer Woman’s blog. I left out coconut and walnut, and the crust is still crumbly, but not intolerably so. The fruit filling tastes like prune or plum filling, so feel free to jazz it up. I added a bit of cayenne to give it a small kick. Wait until the bars cool before you cut and eat them. Bet you can’t eat just one! If there’s any left, they freeze well. Look for Black Sapote Bars at the Bee Heaven Farm tent, at Pinecrest Farmer’s Market this Sunday from 9 am to 2 pm. Or make your own with this fourth generation recipe. Enjoy! 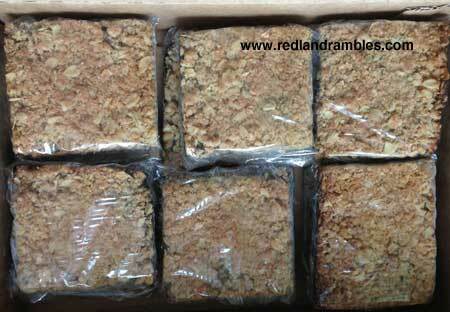 Black sapote bars wrapped, boxed and ready for market. 2. In a large bowl, mix together flour, oats, brown sugar, baking powder, and salt. Cut the butter in with a pastry cutter until it looks like coarse crumbs. Sprinkle half the mixture into the pan, and pat it lightly to pack it down. 3. In another bowl, mix together the cleaned black sapote (no skin, no seeds) with the other filling ingredients. Spoon the mixture on top of the bottom layer of crust, and spread evenly with a butter knife. 4. Sprinkle the other half of the oat mixture over the top, and gently pat down. 5. Bake until light golden brown on top, about 25-30 minutes. Remove from oven and let cool in pan. When cool, cut into squares and serve. Looks great, Marion! I’m hoping to get to the garden on Sunday. Thanks so much for the mention!